It's the tradition that marks the passage into adulthood for girls, but now an increasing number of women - like the author - who never experienced a bat mitzvah are journeying into synagogues to see what they missed or to discover a piece of their adopted faith. THE GROUP IN THE TEMPLE SANCTUARY QUIETED AS MY MOTHER APPROACHED me. She unfolded a prayer shawl, unveiling an image of the biblical Miriam painted on the silk, the figure dancing on yellow sand, shaking a timbrel and guiding women through prayer and song. My mother draped the shawl, known as a tallit, around my shoulders as I stood behind the mahogany bimah at Temple Shir Tikvah in Winchester. Miriam, rejoicing after the Red Sea parted during the Jews' flight from Egypt, had led others in prayer, an act unheard of for women in her time and still rare during my mother's childhood and even part of mine. Now I, like Miriam, the sister of Moses, would lead others in prayer. At the age of 41, in early May, I was about to celebrate my bat mitzvah - 28 years late, according to Jewish traditions. The rabbi stood to one side of me and the cantor to the other. At the back of the sanctuary, a handful of women, ranging from my age to 80, sat in solidarity. Most of them would mark their bat mitzvahs together in early June, while one would wait until October. The eight of us were the second adult bat mitzvah class in the temple's 22-year history; the first class, five women, held their ceremony in 1998. We studied Jewish history and ritual, the Bible, and Hebrew, and we dug deeper to figure out how religion fits into our busy lives. Just as thousands of 13-year-old girls and boys do around the country each year, we prepared to chant a passage from the Torah - the first five books of the Bible written in Hebrew without punctuation or vowels. We are part of a movement: During the last decade, the practice of an adult marking a bat mitzvah has become increasingly popular and an institution in both Reform and Conservative temples. Even Orthodox women are shaking up tradition, learning rituals once forbidden to them, though the pace of change is slower. If, for example, an Orthodox woman leads a service today, something unheard of a generation ago, it's almost always in front of women only. Under Jewish law, during your first year as a teen, you automatically become a bat or bar mitzvah, a daughter or son of the commandments, ready to follow the Torah and participate fully in Jewish ritual. Boys, for centuries, have celebrated this moment in front of their congregations, but in North America, the first known bat mitzvah ceremony was in 1922. And until the 1960s and 1970s, Jewish girls in the United States were not encouraged and sometimes not permitted to have a bat mitzvah ceremony. The earliest adult bat mitzvah programs started in the 1970s as grass-roots efforts. "Women became doctors. They became lawyers and whatever else, and nobody questioned that. But in the religious field, the feeling was you don't have to bother with the women," says Hadassah Blocker, 92, who began an adult bat mitzvah program with three students at Temple Emanuel in Newton in 1976. "I feel the women are the mothers, the wives, and they should know what they're talking about." Some credit the Hadassah organization, a national Jewish women's group, for giving the adult bat mitzvah movement its biggest boost. Between 1995 and 2001, Hadassah held group adult bat mitzvah ceremonies - one with as many as 180 women, including some who had converted to Judaism - at its annual conventions. "There are people who believe the synagogue is the realm of men," says Barbara Spack, the Hadassah bat mitzvah program founder. "We wanted to make equal access for all." If there was a critical step, it came in 2001, when the Union of American Hebrew Congregations created a guide on adult bat and bar mitzvah programs, and 700 of the 900 Reform synagogues requested it. A year later, the Women's League for Conservative Judaism developed its guide. What began as an outlaw activity is now commonplace simply because so many women wanted to become competent in the practices of Judaism, says Sylvia Barack Fishman, a professor of contemporary Jewish life at Brandeis University. "There have been women of all branches who didn't know Hebrew or knew rudimentary Hebrew and knew nothing about Jewish history," Barack Fishman says. "These were women struggling with the question 'What does it mean to be a Jew? Why bother?'" Women did not get access to a Jewish education and public worship until the mid-19th century, and the first women were not ordained as rabbis until the early 1970s. As the feminist movement took off in the United States, so did Jewish women's push to get the education they needed to become ritual leaders in the sanctuary. 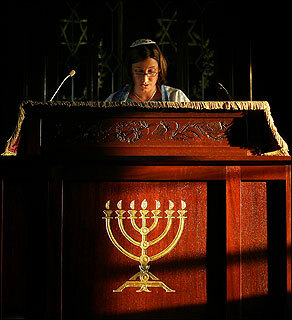 Women already served on boards of temples, yet during services, they did not know enough to practice the ancient tradition of chanting from the Torah. In the last decade, many women who grew up in secular Jewish homes and never attended religious school joined the classes to affirm their Jewish identity. "It is appealing to people who feel, for a variety of reasons, that they have felt disenfranchised in the past," says Lisa Grant, an associate professor at Hebrew Union College in New York who studied the experiences of 15 women. "Now they feel it's time to get that sense of personal mastery and legitimacy." FOR SOME WOMEN, THE experience of adult bat mitzvah is more than empowering - it's life-changing. Nancy Sargon-Zarsky, of Newton Centre, who joined one of Blocker's classes, celebrated her bat mitzvah with eight others in 2000 at age 47. Since then, she has left her job running an adult day health center and decided to become a cantor and Jewish educator, enrolling in the cantorial studies program at Hebrew College in Newton. Cantors take on many roles in temples, including leading congregations through the songs in services. Sargon-Zarsky, who has taught her son and daughter how to read Torah, also participated in an oral history project last year at the Jewish Women's Archive in Brookline. She says of her bat mitzvah ceremony: "I felt that day like we had owned the synagogue. It enriched my life. I never would've thought I would've taken this path." To Sargon-Zarsky, who grew up Jewish in Brookline and went to Hebrew classes as a girl, her bat mitzvah studies were an extension of what she learned as a child. For Ruth Anna Putnam, who also took part in the oral history project, her bat mitzvah at age 70 marked an introduction to Judaism she never had as a child. Putnam, a retired Wellesley College philosophy professor who lives in Arlington, was born in Munich in 1927 to political-activist parents who saw themselves as atheist. By birth, her father was Christian, her mother Jewish. When Putnam was 5, her parents, openly opposed to the Nazis, went into hiding and sent her to live with her paternal grandparents, who initially tried to raise her as Christian. But Putnam, treated as a second-class citizen because she was a half-Jew, began viewing herself as a Jew. She was expelled from high school because of her heritage. "I was expecting any day to be arrested and sent to a concentration camp," Putnam tells me in a voice tinged with a slight German accent. Putnam escaped detection on her grandparents' farm. In 1948, she reunited with her parents in the United States and went on to college. In 1962, she married Hilary Putnam, a Harvard philosopher. He, too, had a Jewish mother and non-Jewish father and was raised as an atheist. The Putnams, though, attempted to establish a Jewish home for their children. At Passover, they would try to get invited to other Jews'homes for Seders, having "no idea how to do it ourselves," Ruth Putnam says, chuckling. Then in 1975, their eldest son, Sam, then 12, said he wanted a bar mitzvah, delighting his mother. "It was," she says, "like spitting in Hitler's eye." Sam's parents also began studying Jewish ritual and Hebrew and attending services. In 1994, Hilary Putnam celebrated his belated bar mitzvah, and four years later, his wife did the same. When she looks back on that day, Putnam, now 78, sees herself sending the same message as all bat or bar mitzvah celebrants - whether they're 13 or 80: "We are not going to finish Hitler's work for him. We are not going to assimilate." MY EXPERIENCES WITH ANTI-SEMITISM during childhood were devoid of danger and more subtle than Putnam's, yet they also influenced my desire to learn more about Judaism as an adult. Though my family celebrated Jewish holidays, my father came from a non-religious Jewish family in Chicago and never learned Hebrew. He connected to Judaism through culture and history. My mother went through Sunday school, learning Hebrew and Jewish history during her childhood in Dorchester. As far as she knew, a bat mitzvah ceremony did not exist in the 1940s. At services, she and the other women sat upstairs. Now 70, my mother attends a monthly study group for Jewish women and says she has no desire to celebrate a bat mitzvah. I spent my early childhood in western New York State, in an area with roughly 250 Jewish families. But when I was 9, in 1974, we moved to Findlay, Ohio, which had only a few Jewish families. The closest temple was nearly 50 miles away. My two siblings and I were the only Jews in the school system we attended. The first day at school, a church member taught about Jesus during my fourth-grade class and my brother Kevin's sixth-grade classes. Because my parents complained, my brother and I were excused to sit in the library during the Christian Bible study. Some kids taunted me, saying if I was Jewish, I didn't believe in Jesus and would go to hell. I was an outsider in Findlay, and because I had dropped out of Sunday school, I often felt like an impostor at Jewish High Holy Day services in college. During my last year in college in 1986, my brother Kevin was killed after he fell asleep while driving. He was 23. Religion should have been a balm at a time of grief, but for me, it was useless. For years, I searched for ways to ease the pain of losing my fun-loving brother and confidant. I seldom attended services, though I did join Jewish community choirs. When I moved to Dallas in my early 30s, I became a member of the chorus at Temple Emanu-El, a Reform congregation, and, eventually, the temple. In rehearsals, our director, Simon Sargon, would nudge us to think about the meaning behind the Hebrew printed phonetically on the song sheets. Once, I watched in awe as Sargon's daughter, Olivia, a few years younger than I, walked down to the bimah to read from the Torah during a High Holy Day service. Olivia chanted with understanding and passion. I wondered if I might do that someday. A few years later, after I moved to Boston, I accompanied my aunt to Shir Tikvah in Winchester for High Holy Day services. At a temple event months later, after a congregant mentioned Shir Tikvah had an adult bat mitzvah class, I said that I was interested. The rabbi, Richard I. Meirowitz ("Call me Rabbi Rim"), invited me to join a Sunday night class. When I had lived in Dallas, I had been frustrated because I could barely read or understand the Hebrew in the prayer book, and I had toyed with the idea of joining a group class at my temple but never seemed to have the time. Now, though I had a new job in another city, the timing seemed right. I wanted to connect to the Jewish community, and I was ready to understand what my religion had to offer and learn how to cope better the next time life dealt me a horrific blow. In early 2005, I joined this group that began with 10 women and ended with eight, each with a different reason for being there. Marissa Seligman, who avoided Hebrew classes in childhood though her parents were leaders of their temple, enrolled in the class partly on a dare with her son. The Winchester resident had taken part in her daughter Ariel's bat mitzvah in 2003 but "felt I was a little bit out of my league." After Ariel's ceremony, Seligman's son, Jarad, began worrying about his bar mitzvah service. "I said, `If you do it, I'll do this,' " says Seligman. Jarad, 13, had his ceremony in March, and, along with Ariel, 16, he tutored his mother in Hebrew. Seligman's ceremony was June 3, a month before she turned 50. "I was doing it mostly as a mother, so I could understand what my kids have done." Jeanette Macht, a lawyer and mother of two from Lexington, joined our class hoping to end an internal struggle over her Jewish identity. Her father was Jewish, her mother Catholic. Though raised Jewish, Macht began to question her identity when, as a teen, she neared the end of Sunday school. Parents were supposed to take on various roles in the confirmation ceremony, but the rabbi said of Macht's mother's task: "Oh, choose something else. Your mother can't do that because she's not Jewish." Two months ago, as her bat mitzvah ceremony loomed, Macht became anxious about her personal statement for the group's program. She worried that she might offend her mother with such a public pronouncement of Judaism. But after Rabbi Rim and her mother reassured her, Macht wrote: "I am both my mother and my father. . . . From my mother, I derive the strength to tackle life's hardships. She is the most accepting and giving person I know. Her friendships are a beautiful patchwork of faiths, colors, and genders. . . . From my father, I have my love of Torah. He has nurtured my spiritual side from early on." A bar or bat mitzvah "speaks of the past and the future," Rabbi Rim says. It was true for Macht. It was true for me. DURING MY CEREMONY ON MAY 6, MY parents and other relatives took a role, as did Pavlik Mintz, whom I began dating more than a year ago, shortly after I started bat mitzvah classes. Mintz is also Jewish, never had a bar mitzvah ceremony, and learned Hebrew and Jewish ritual as an adult. He came to the bimah and helped me sing a Hebrew prayer, a role the rabbi gave him after he chimed in during a rehearsal. As the service progressed, my first cousin and her 12-year-old daughter, who will mark her bat mitzvah in January, pulled aside the cranberry-colored curtains cloaking the Torah. My Hebrew teacher lifted the heavy scroll and handed it to me. My parents, uncle, and classmates said prayers blessing the Torah, as did I when the rabbi called me by my Hebrew name - Sarah Yacova, given to me by my parents in memory of a great-grandmother and great-uncle. My eyes roved over the Hebrew as I chanted, my voice rising and lowering, and at times, singing five notes for one syllable. With one blink, I could end up staring at the wrong passage. But I kept my place, touching the pointer to each word as I read nine verses of Leviticus. In a speech interpreting what I read, I connected the Torah to my past and future. The Hebrew I chanted defined the circle of mourners who should follow the laws my faith designed for grief - parents, siblings, children. I spoke about how Judaism gave us a structure for grief, though my family did not follow it after my brother died. We never spent a week "sitting shiva," taking time to mourn and accept others' comfort. I spoke about how Rabbi Rim taught my family to mourn in a healthier way after my maternal grandmother died at age 102 in late 2004. After the funeral, sitting with my family in my cousin's kitchen, Rabbi Rim made us comfortable enough to talk about my grandmother, and my brother. "The rituals give us tools to cope, but we can't use them if we don't know what they are or how to begin," I said during my Torah commentary. "The intent of sitting shiva and a 30-day further mourning period is logical: Don't force the hurt and anger out in a week. Share the memories and the tears as well as the laughter." As my service drew to an end, I led my family and friends through "Miriam's Song," by Debbie Friedman. Friedman based the song on a passage from Exodus, the source for the Hebrew curving around my prayer shawl's blue collar: "And Miriam the prophetess took the tambourine in her hand." The cantor, Beth Levin, strummed the guitar as we sang: "And the women dancing with their timbrels, followed Miriam as she sang her song. . . ."
"Get closer to the mike," Levin urged. I grinned, moved nearer, sang louder, and clapped to the upbeat tune. I was comfortable up there, leading others, no longer a stranger in my own house of worship. Linda K. Wertheimer is the Globe's education editor. E-mail her at wertheimer@globe.com. High Stakes Bet On It Your view? COUPLING: My Soul Mate? Check.